I am talking about this book- Making Gourd Dolls & Spirit Figures, by Ginger Summit and Jim Widess. I just got my copy and am pleased as punch! I can’t quite figure out why they put someone elses doll (the one the upper left hand page) on a page with my name on it, but… hey, I am very glad to have the photos of my dolls together! 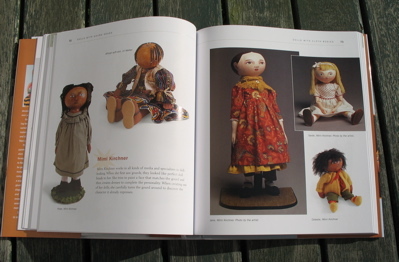 The book has a great range of examples and instructions for making dolls from gourds- very interesting. Am I the last person to read this post on Yarn Harlot? It resonated with me. I fell in love over the weekend. I’m going to have to get one of these for my garden- Lady in Red Hydrangea. I saw on my stats that someone had searched for “m kirchner pottery”. That was how I used to sign my pots. I had this crazy idea, right out of college (actually someone told me!) that it would be better to make my signature gender ambiguous so I would be taken more seriously. That was 1976. I don’t think I fooled anyone. My imagery hasn’t changed much when I switched over to fiber arts. I’ve killed my website, which never was much of a website anyway. Mostly it was just a front door to my photo galleries. Now if you go to Mimi Kirchner.com, you will be here at the blog. This is where the action’s at anyway. Hopefully this will be an incentive to do some clean up chores and rearrange the furniture around here. I hope this doesn’t mess anything up for anybody. 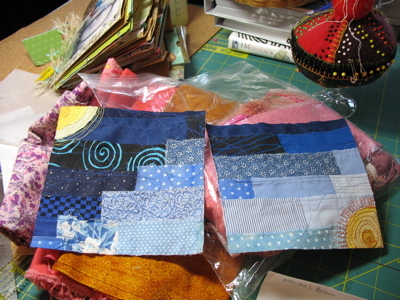 And, I am working on Amy‘s paperbag swag pages. The thing I’ve loved about this project is that it has given me a place to try out some techniques/ideas/materials that never seemed to fit in anywhere else. 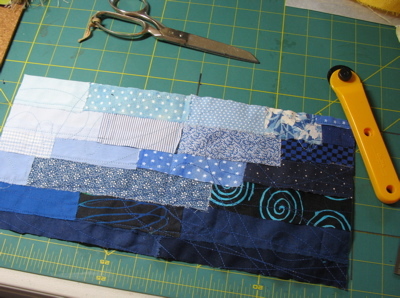 I have always admired Abby’s scrappy patchwork fabrics and have wanted to try making some. I love my copy machine. 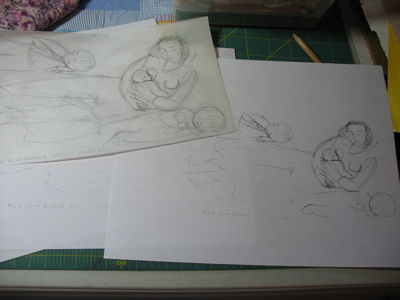 I did the drawing and then copied it in several sizes to see how it works on the piece. I am posting these now to get me through the winter. This entry was posted in General, nature, paperbag swag book, personal, progress report by mimik. Bookmark the permalink. Congrats on being published! It’s a real kick, isn’t it! congrats, mimi! that’s so exciting! does Mimi still do pottery? congratulations on being published! and i have to tell you, just seeing the sketch takes my breath away. i think i will have to commission a larger version to hang somewhere in the house. In a book – holy moly or something. That is so great, big congratulations from me! Beautiful images and the blue fabric – mmm! Mimi: Missed the last few Doll club meetings and Didn’t know about your being published, Congratulations ~ ! Well deserved you’ve worked hard for it ! Hoping to return in September ! Aee you then. 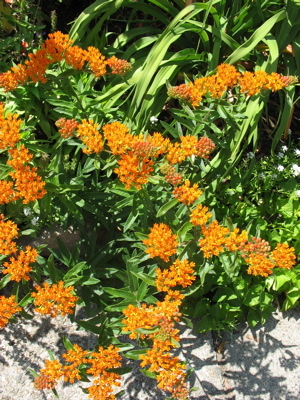 Have a wonderful Summer I have done a lot of gardening this summer too, your flowers are beautiful too ! Now I have to get busy on some dolls too.